A wave of injuries has ravaged the fantasy landscape, making this a busy week for waiver activity. Fortunately for us, there are a ton of options available. As always, the players you target should be the ones who are best suited to your team and your league’s settings. However, this week is a particularly important week to also factor in schedule considerations. There are significantly more games than normal in Week 23, and those games are not evenly distributed. The Warriors play five times next week — the final five-game week of the season for any team. That includes back-to-back sets on Monday-Tuesday and Saturday-Sunday. Given their propensity to “load manage” late in the season, it’s likely that most of their starters will get a night off sometime this week. That makes fringe-Warriors pickups like Alfonzo McKinnie (0 percent rostered) all the more appealing, as not only will he see five games instead of the usual three or four, but there’s a good chance that he sees extra minutes as a spot-starter. He’s still probably only an option in deep leagues; without the generous schedule he wouldn’t be mentioned here at all. Two teams, the Nets and the Magic, play only twice next week. Due to the busy schedule, that’s more damaging than usual. 16 teams play four games, and 11 play three times. The daily schedule is pretty flat, with between six and nine games every day. Flat schedules mean that active managers maximizing their league’s streaming rules can gain a bigger than usual advantage. 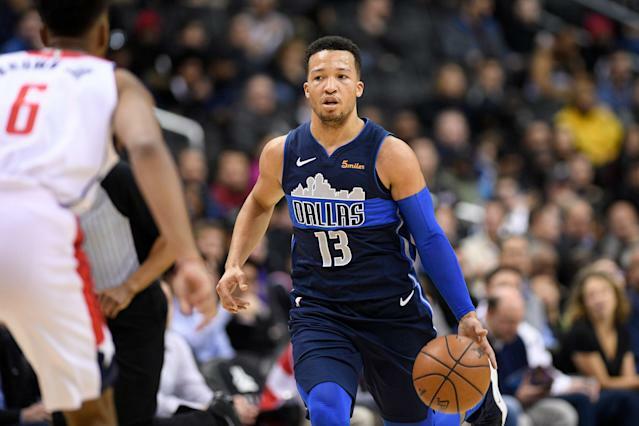 What started as a novelty has turned into the norm, and Brunson has now knocked Trey Burke completely out of the Mavericks’ rotation. The rookie’s role has increased throughout the season. Though he became a regular starter following the Porzingis trade on January 31, his minutes and effectiveness remained limited at first. After the All-Star break he began to blossom, and he’s reached full bloom over the last week, averaging 22.5 points, 5.3 assists and 4.8 rebounds in 35.0 minutes. That production may cool off, but his post-All-Star break figures of 16.4 points, 4.3 assists and 3.5 rebounds in 30.4 minutes are still good enough to roster. The Pelicans probably aren’t the most frustrating team when it comes to injury reporting, but they’re in the conversation. Jrue Holiday (abdomen) is slated to be re-evaluated in the next couple days, but that doesn’t necessarily mean he’s about to return. He’s on track to miss at least another game or two, but he could miss even more. In the last three games with Holiday out, Jackson has averaged 19.0 points, 4.3 rebounds and 1.3 threes in 34.7 minutes. Once Holiday does return, however, Jackson has minimal fantasy value and can safely be dropped in most settings. Are you happy, universe? You finally got me to unironically include Len in a waiver column. I’m going to have to go shower now. I don’t trust Len as far I can throw him — and, given that he’s about 15 inches and 70 pounds larger than me, I don’t think I could throw him very far. But weird things can happen late in a season, especially on teams that are out of the playoffs, and even more so for a team in the Hawks’ current position. The Hawks are all but guaranteed to end the season and enter the lottery with the fifth-worst record in the league. They have no chance of losing their way into the bottom four, and it’s supremely unlikely that they climb to sixth. In this netherworld where nothing matters and anything goes, Len has somehow averaged 17.0 points, 7.3 rebounds and 1.1 blocks over his last seven games. Just a reminder: Alex Len is not good at basketball. He’s had good stretches before, and they always flop disastrously. That said, this is possibly the best situation Len’s ever found himself in, so if he’s ever going to extend a hot streak now would be the time. He’s done enough recently to warrant adding in most leagues, just don’t get too attached. And be prepared for the inevitable two-point, four-rebound game — a box score he’s compiled 13 times in his career, including twice this season and once this month. Few teams have been more frustrating than the Timberwolves when it comes to injury reporting this season. For example, on Thursday the team’s PR department announced that Andrew Wiggins was starting that night, only to have the official team account tweet out that his status was still undecided an hour later, as though unaware that the determination had already been made. If the team can’t even communicate injury news internally, then it shouldn’t surprise anyone that the information they provide to the outside world is minimal and misleading. So maybe Derrick Rose (elbow) and Jeff Teague (foot) will be out for the rest of the season, or maybe one or both will return this weekend. Both missed the last two games and are still “day-to-day.” All I know with certainty is that as long as they are out, I want Tyus Jones in my starting lineup. Jones has started both of the last two games, averaging 14.0 points, 6.0 assists and 1.5 steals in 28.0 minutes.